The CIPAST project was a coordinated action on citizen participation within FP6 which ran from 2005 – 2008. This project aimed at bringing together organisations with significant experience in the use of participatory procedures in scientific and technological issues from different areas of expertise such as parliamentary offices, research institutes, academic teams, science shops and science museums. Bringing the actors together, pooling their various capacities, and integrating their various contextual perspectives through a common platform, CIPAST provided an occasion to collect and disseminate useful practices and to share the experience of public participation initiatives. It also fostered the emergence of a European culture of participatory democracy in scientific and technological issues and aimed to promote more socially sound innovation processes. 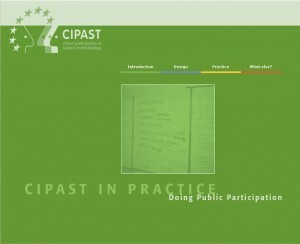 The two main CIPAST objectives have been to structure and expand networks of current and potential actors in participation through the dissemination of best practices and circulation of information, and to foster the transfer of expertise through the implementation of training sessions and the production of a “training package” based on case study methodology. CIPAST IN PRACTICE now provides elementary sets for teaching and learning which are based on ‘real life case studies’ and which can be used and re-assembled by potential users. The tools are completed by information resources about designing participatory procedures, experts, literature and additional experiences. Visit the CIPAST website (external link, last accessed 27 March 2014).